Looking for a deeper Bible Study? Try Lambert Book House Adult Bible Study Series. 12 books, 96 pages each, 13 lessons per quarterly book plus discussion questions for each lesson. 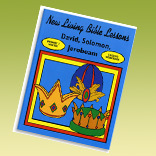 Insightful, detailed Bible studies in a survey format. Learn about Bible characters and their nations, Bible events, cultural and historical backgrounds of the peoples and their relationships with God.